An amazing workshop... Like watching 'best practice' in action. Maria Hayes, Artist, Educator, Trainer. Thank you so much for such a professional performance - you had the kids in the palm of your hand and the teacher was VERY impressed. Head Teacher, Pimlico School, London. A huge thank you for the drumming workshop, it was a great success for us and thoroughly enjoyed by all. Treasurer, Vale Womens' Business Network. Iolo…helped me reach some of my more challenging children through music. ...the staff are left with a new understanding of the value of music in education. Director, Celebrate the Children, New Jersey, USA. Thank you for yesterday... It was so much fun! I'm really glad that I got the opportunity to see the work in action... you were great with the kids. Education Administrator, Wales Millennium Centre, Cardiff. I can only praise and compliment Iolo... the comments from pupils and staff were very positive. Head Teacher, Litchard Junior School, South Wales. Everyone enjoyed themselves very much. The sessions really enriched our African-themed arts week. Thank you! Percussion is a fantastic medium for providing people with a near-instant experience of group music-making. I have been conducting workshops in schools, festivals, community centres, events and private venues for over ten years. 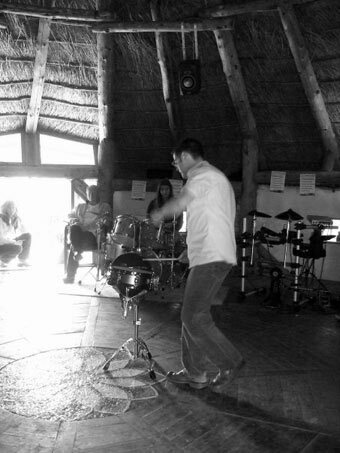 Workshops usually feature hand-percussion and focus not on technique but on rhythmic content and collective creativity, interaction and improvisation. I can teach workshops across a range of needs and settings, from toddlers to teacher training, from beginners' taster sessions to advanced rhythm studies for experienced musicians. If you're interested in organising a percussion or rhythm workshop at your establishment or event, please get in touch.